I've been blogging a while, but never really out in the open as myself - except on myspace and that doesn't really count. The picture is of me with a child at an orphanage in the town of Otukpo, Nigeria in November of last year. We got there right in the middle of bath time - the oprhanage, not Nigeria. As far as I know there is no national bath time there like my parents used to tell me there was in the US. Anyway, it was bath time. You could tell because there were washtubs of soapy water outside, naked kids running around on the porch and a rooster up in the trees. 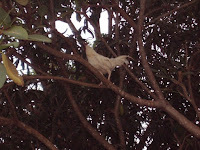 Apparently roosters are so desperate to avoid a bath in Nigeria that they will actually climb trees to escape the experience. Think I'm kid ding? Check out the pic. A real life tree climbing rooster! Emily went with me and we both had a wonderful time. It was a little scary getting out of Nigeria, though. We ran into a protest that included many angry young men with clubs blocking the road in and out of town with fallen trees. After being stuck for about 45 minutes, one protestor actually talked the others into letting us pass. Since they let us go, they decided to let all of the other cars go as well. But by now the road was jammed since people traveling in both directions had taken up every lane. So you had cars spread across four lanes staring at each other in gridlock. "We will tolerate such treatment form the government no more! We demand our pension payments! Our families starve while the government officials dine on the fat of the oil companies! We will never give up! We will bring chaos to this land! . . . Oooo! My stomach is rumbling. Time for dinner . . . Okay, thanks for coming to our riot. You may all go now. Please follow the directions of the young men who were just moments ago beating on your vehicles. Thank you and drive safely." I'm not making this up. It was the craziest thing I've ever seen. If I go back, I hope that I can spend more time working with kids, or working on a project to create a better living environment. This time my job was to preach three different times - once at a revival, once at a pastors conference and once for a Sunday morning church service. It was a great experience and worth the trip, but there was a lot of unproductive down time. And if you know me, I love me myself some down time. So I can't believe I'm really about to say this, but . . . sometimes you can have too much down time. That still sounds soooooo wrong.